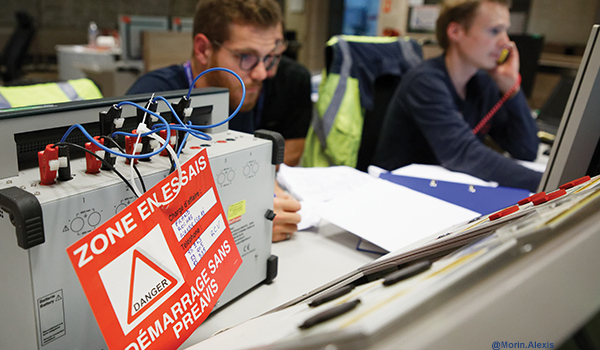 The Sceptre simulator delivered by CORYS in Spring 2017 enabled FRAMATOME to spend several months preparing for cold testing of the Flamanville 3 reactor. Romain Balp shared his impressions with us. You used a simulator for the commissioning of the Taishan EPR reactor. In what ways is Sceptre different? Firstly, its scope is smaller: it covers the steam generator and some auxiliary and secondary circuits, for various unit statuses, ranging from cold shutdown to full power. What exactly did preparation involve? Firstly, we wanted to debug our testing, check that procedures were appropriate, and ensure instructions were compliant, clear, and exhaustive. The aim was to assess feasibility, so as not to take any physical risks with the reactor. The second aim was to debug specification and/or I&C implementation errors. Lastly, we reported back any potential problems, having checked that these were not due to the limits of the simulation itself, which could potentially result in discrepancies between simulated and on-site tests. Did you use the simulator for training purposes? Most of our work concerned the earlier phase of documentary preparation and debugging. However, we also used Sceptre to train the twenty or so AREVA engineers responsible for cold testing. Although they had some degree of familiarity with the environment and the dynamics of the power plant prior to the start of cold testing, this familiarity was often limited in scope. Repeated cold testing gave them an opportunity to familiarise themselves with the whole of the MMI and experience the entire testing phase. Did your task come to an end once the tests had started? No, I’m involved in them, too. People have appreciated and acknowledged the expertise provided by the simulator: it allows them to detect and deal with problems at an earlier stage. Indeed, the simulator experts and most advanced users now form an integral part of the start-up team.